Ever since the movie adaptation of IT was released, I've been really obsessed with the story. I've now seen the movie a total of three times and I'm currently working my way through the novel which has the same length and width as the phone book. Today I'll taking a look at the original mini series from 1990, adapted from the book. I'd been kind of putting this off for a while as I'd heard it wasn't too great, but the other night I decided to watch it all in the one sitting to see how it was, so here are my thoughts. This is going to be spoiler free. With the new film adaption it shows the entire movie with the kids still as kids, whereas this adaption does it a bit differently as almost the entire first half follows the kids 30 years on from the events we know from the 2017 movie. It does start to feel a bit repetitive as it follows a formula for the first half where we follow each of the main characters individually, as almost every one of them has a flashback to their separate encounters with an entity known mainly as IT, or Pennywise when he's in clown form. IT terrifies it's victims before trying to kill them and eat them. These separate encounters are probably the best parts of the mini series as the kids, while not perfect, are the best actors of the whole series (or most believable anyway) and they are definitely the most entertaining. 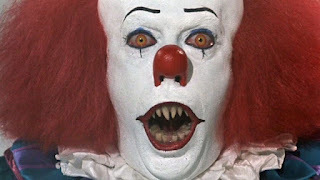 This is mainly due to the iconic performance of Pennywise (or IT), as played by the awesome Tim Curry. There's a reason why people have been afraid of clowns for some time now, and this Pennywise has to be one of the main reasons why. The performance is kind of over the top but it works so well. It may not come across as scary nowadays, but it can be unnerving and when he has his sharp teeth bared, it's hard not to be a little creeped out. The first half is basically a tamer version of the 2017 version with the kids being terrorised by IT and working up the courage to try and fight back. There isn't much blood and gore to be had as it was made for TV but it doesn't affect the story and the great scenes with IT that much. Definitely the best parts of the series included here. The second half on the other hand........ pretty much sucked. This is where the story follows the adults heading back to Derry to face off with Pennywise once again. Pennywise is still around to bring us some fun at least but I just found the adult actors laughably bad at times leading to some scenes I can only describe as cheesy. While I won't spoil the ending I can say it was pretty disappointing considering the buildup of the whole series and just came across as silly. Especially the very last scene which is just ridiculous and a terrible way to end the whole thing. The whole series is about 3 hours in total any I'll admit I struggled with it. The first half is an easy ride, but once you realise you still have an hour and a half to go during the worst part of the feature, it really is easy to just turn it off due to disinterest. 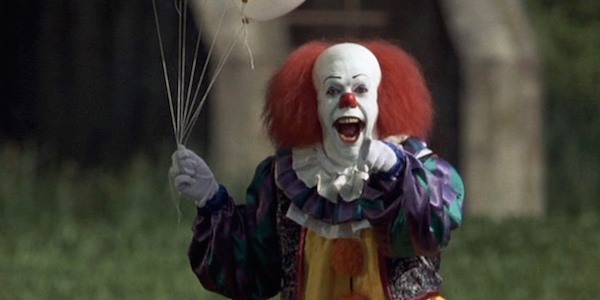 I feel like I might be crucified for not liking this, but whenever anyone mentions this series, it really is only the Pennywise scenes that are remember fondly as everything else ranges from bad to kind of good. I really wouldn't recommend watching this unless you're a huge fan of the book or are just interested after seeing the latest adaption. Trust me, you might not want to watch this more than once.